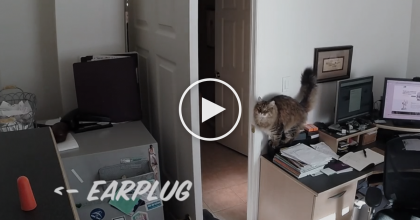 He walks up to his cat and says “Ya Hungry?” but you’ve gotta turn your volume up and listen, it’s just TOO cute for words – This sweet kitty knows the code word “hungry” and reacts in the cutest and funniest way ever, hahaha!! It happens SOO much that he was able to record the cat’s reaction to him saying “ya hungry” and it’s the best thing ever! – Maybe this cat thinks his name is “hungry” Hahaha – This kitty is the SWEETEST ever! Make sure your volume is up or this one, awwww!! Just watch the video! 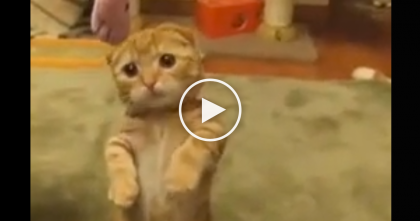 Tiny Ginger Kitten Tries Catching A Toy, But Watch What He Does To Get It… AWWW!! 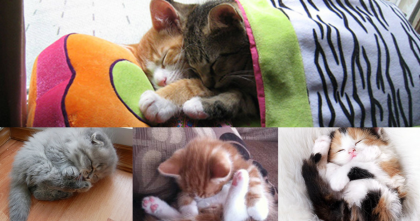 Itty Bitty Kitten Is SOO Small, It’s Almost Too CUTE To Be True… Just Watch His Finger And See, OMG! 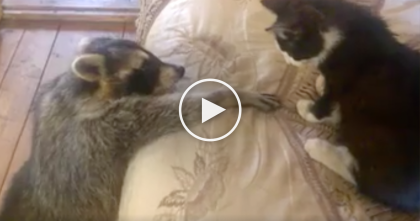 Kitten Reacts To “Needy” Raccoon Who Wants To Be Friends… LOL, He Doesn’t Know What To Do?! This Cat Wants His Toy, But The Way He Manages To Get To It Is CRAZY… How In The WORLD? !